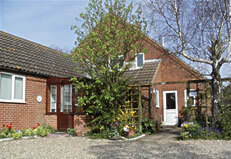 Situated just off the main road into Orford, within easy walking distance of all the village amenities and attractions. It is also in an ideal position to explore all the nearby coastal towns including the famous Snape Maltings. All the rooms have tea and coffee making facilities, are tastefully decorated and have a T.V.